Do you want to add some style to your dull looking engine? Why not add some new Chevrolet licensed valve covers from Proform to give it a new clean finished look you're after. 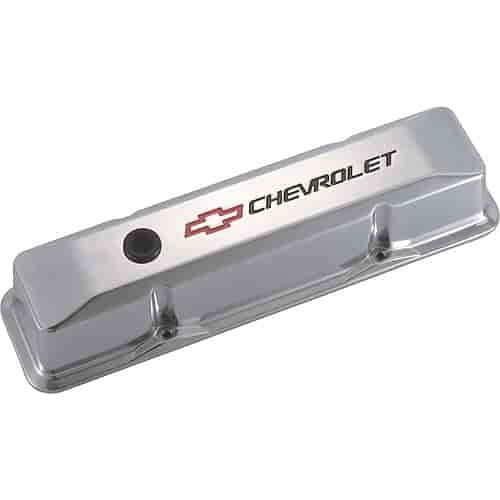 These Officially Licensed Chevrolet Die-Cast Aluminum Valve Covers are made to Chevrolet specifications with most including internal oil drippers and OE-type baffles. Does Proform 141-108 fit your vehicle? 141-108 - Officially Licensed Chevrolet Die-Cast Aluminum Valve Covers is rated 2.0 out of 5 by 2. Rated 2 out of 5 by scott_s from Disapointed The finish on this product was average. It is a satin finish, that looks like someone was in a hurry to knock out their daily quota. There were some places that looked like they were barley touched. Yes you could probably buy some scotchbrite material and blend it in, but why should you have to. I am not going to use these, and have already purchased another product. Mr Gasket 9820 - Valve Cover T-Bar Wing Bolts Length: 5"